Aladdin is the multi-Tony Award winning, multi-faceted jewel in Disney’s crown, a decadent feast for the senses – flawless – rich in colour, romance, action, ambition, greed, honour, mischief, magic, glitz and glamour, and losing nothing of its original heartwarming essence. Booked yet? Based on the 1992 animated film, and even more spectacular on stage, Aladdin’s intricate popup storybook sets are immediately transportive. The skyline alone is an Instagram Influencer’s dream! (Are the presets available for purchase?). Masterfully designed by Bob Crowley and superbly lit by Natasha Katz, with more than 300 lavish costumes on display, glistening with thousands of Swarovski crystals (Gregg Barnes), and gifted with swirling, seamless choreography making a showstopper of every musical number (Casey Nicholaw), AND with its extraordinary talent and automation, this sensational production is the must-see musical theatre event of the year. We were just discussing the need (or not) for overtures the other week, and this production, directed by Casey Nicholaw with musical direction by Geoffrey Castles, opens both acts with one, celebrating the many moods of the Middle Eastern influenced music composed by Alan Menken and from the first strains, freeing us from the throes of daily life and city traffic for a couple of magical hours. Additional songs have been added back into the stage production after being cut from the film, with lyrics by Disney dream team Howard Ashman and Tim Rice (with book & lyrics by Chad Beguelin). It’s got to be one of the catchiest, most uplifting scores of contemporary musical theatre. One of the reintroduced songs, the poignant Proud of Your Boy, showcases the acting chops and golden voice of Ainsley Melham, who brings the title role to life. This guy is set for superstardom. With effervescent energy, a mischievous grin and Disney leading man chiselled good looks, Melham is one of several WAAPA grads in the company, and a perfect match for this Princess Jasmine, Hiba Elchikhe. Hailing from the UK and Mountview trained, Elchikhe is divine and definitely the strong-vulnerable female role model you’d hoped your own little Princess Jasmine would get to see at stage door after the show for a #twinning pic. It was a JOY to see so many excited kids at opening night, lighting up the foyer with their bright eyes and infectious smiles. I only wish our major productions could be made more affordable, allowing even more families to enjoy a night out at the theatre together. Honestly, especially in this case, it can be the life-affirming, life-changing stuff of a happier childhood and a more harmonious household! WELL, THERE IS NOTHING UPLIFTING OR LIFE-AFFIRMING ABOUT YOUR FOOTY TEAM LOSING, IS THERE? TRY A NIGHT OUT AT THE THEATRE. Adam Murphy’s Jafar is suitably imposing and delightfully wicked whilst remaining so suave when having to play the perfect gentleman and advisor to the Sultan (George Henare, charming and pleasingly, far more sensitive and intelligent than the bumbling / loveable old fool in the film). Jafar’s sidekick on stage, the parrot of the film, is henchman Iago, played with perfect comic timing and terrific physicality by Aljin Abella. Together these two give Aladdin’s three friends a run for their money in terms of laugh time. Kassim (Adam-Jon Firorentino – please stay in the country now), Omar (Robert Tripolino) and Babkak (Troy Sussman) replace Abu, Aladdin’s beloved on-screen mate, a monkey, and they share some wonderfully funny moments, as well as getting the chance to shine as individual performers. In this superbly talented ensemble we don’t expect to see any stand outs, and yet Brisbane’s Kimberley Hodgson is just glorious in every moment. I’d love to return to see her play Princess Jasmine. (Jasmine’s second understudy is Heather Manly, whom we recognise from Showwork’s Heathers. And though there are times when it is disappointing to miss out on a star performer, with understudies of this calibre there’s no need to give a second thought as to whether or not you’ll enjoy the show if someone is off for the night! This is a truly sensational cast, the strongest sounding ensemble we’ve heard in this space in a long time, absolutely world class). Aladdin is a no-brainer, the ideal date night, or an extravagant and entertaining evening with friends or family. If your household makes it to just one mega musical each year, this year make it this one. Aladdin is beyond splendid. It’s bold, it’s beautifully staged and performed, showcasing some of the country’s most exciting musical theatre talent, and it guarantees the shared experience of a lifetime. Most impressive of all (and let’s face it, it’s largely due to this stellar cast), Disney’s dazzling production puts the heart and soul back into blockbuster musical theatre storytelling… Well, it was time. These two talented entertainers are old friends and it shows. 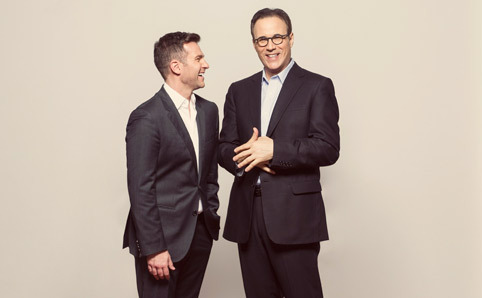 There is such a delightful energy between David Campbell and John Bucchino. Whether or not the music is familiar, this is an enjoyable show and a great, relaxed night out. I love the music, which we got to know very well during Bucchino’s last visit to Oz in 2011, when he joined Georgia Stitt and Jason Robert Brown for a tour of concerts and masterclasses. Bucchino’s CD It’s Only Life has been a favourite in the car ever since and if you consider for a moment how much driving I do that is high praise indeed! The new album, a collaboration between Bucchino and Campbell is out now (and has joined the collection in the car). During Bucchino’s Brisbane masterclass it was fascinating to hear a bit of background – the secrets behind the songs – and observe cabaret magic happen as Bucchino practically handed the vocalists the keys to unlock each song. This we see happening again, but it’s our mate, David Campbell, sharing the intricacies and intimacies of each story, with the perfect example being the opening number, Sweet Dreams. This is a catch-in-your-throat song if ever we heard one. It’s one of my favourite sad songs of all time. It sets a slightly sombre tone for the evening, giving die-hard fans the chance to reimagine the bittersweet stories behind the lyric and newbies (many, I suspect, being television morning show fans) just enough gentle time perhaps to adjust any pre-conceived notions. The mood lifts with the upbeat number that follows, and so begins our rollercoaster evening, punctuated by some super slick shtick and very funny apologies from both Bucchino and Campbell for their over-indulgence in comfortable chat and private jokes to make us feel as if we might be in one or the other’s living room. I enjoyed the pair’s easy repartee, and felt it added to the intimacy of the show. My mum, and others I suspect, might have preferred to hear more of the music! If you know Bucchino you’ll know his music is not exactly all-Broadway and it’s not quite “cabaret” either, but what is that now, anyway? (Campbell explains his take on contemporary cabaret to arts writer, Elissa Blake, here). It’s somewhere in between, and it gives someone like Campbell the perfect opportunity to flex his performance muscles. He’s a born entertainer – we knew this already – but it’s in the portrayal of a character from Bucchino’s Broadway show, A Catered Affair, that we see once again Campbell’s natural acting ability. He steps forward and slips into the role of the father of a reluctant bride and I make a mental note: tell Lisa (Campbell) to get this guy back into musical theatre. (And I do, immediately after the show via Instagram). Campbell even references Shout! The Legend of the Wild One and for half a second it seems that were a musical theatre option brought to the table he might just let an arm be twisted. In stark contrast, it should be noted that Campbell just as effortlessly takes Bucchino’s hit song from the DreamWorks animated movie Joseph: King of Dreams and makes it his own. He makes this little story, one of the complete ones, soar and sear our hearts. It helps that there is so much in the music to share. Bucchino is a precise lyricist and a gifted storyteller, but not in the traditional sense of the word. In fact we almost get just as much story in those apologetic interludes as we do in the songs, as he takes great pains to establish the context of each, remembering and describing the people and places that have served as inspiration. The songs themselves become just snippets! But what intriguing snippets, what delectable morsels they are. (Warning: foodie references to follow). Sometimes they start and end with just a feeling, pure intensity, making me think, inexplicably, of Silky’s Pop Cakes, filled with honey, which she serves with Toffee Shocks and Google Buns to unsuspecting guests in her cosy home at the top of The Faraway Tree. (I found a recipe for Pop Cakes here! Wheeeee!). Of course all composers will claim their songs come from pure feeling but these are different, defining a core feeling from very few words, or from many more words than we might expect. Even when the story “ends”, we can hear that beyond the song the story goes on. The evening is basically a banquet of exquisite tasting plates, just like we find at a couple of our favourite spots that deserve a shout out here, Ole (Little Stanley Street) and the Spice Bar (Mooloolaba Esplanade). Unexpressed and Feels Like Home are lovely, light, warm and delicious little dishes that give us an appetite for something more, something like Puddle of Love. Sweet Dreams and Playbill offer an entirely different taste, like Zumbo’s caramel salted somethings (this is not Zumbo – I know ’cause I finally met him this year at Noosa International Food & Wine Festival! But if you wanna’ try making his macarons this vid is GOOD! REMEMBER- DO NOT OVER PULSE AND DO NOT OVER BAKE. JUST SAYING). On My Bedside Table is the laughter that goes with liquor and cigars at the end of a great night. Taking the Wheel is genuinely joyous; full of zest, and Grateful brings the evening to a gentle, not-too-sentimental close, sending us out with satisfied smiles. This concert is an intimate insight into a long-lasting friendship and two very different – but maybe not so much – creative careers. Bucchino and Campbell are masters of song and story. I feel privileged to have been a guest at what feels like a living room post-show champagne and canapé party around the piano. This is fun, fascinating and truly entertaining cabaret, and it’s touring so get onto it! Tour dates below. Following a four month tour of the US, The TEN Tenors are back on home-soil with a brand new Broadway show! This dynamic live experience is a wonderful collection of Broadway’s most-loved classics sung by Ten of Australia’s hottest Tenors. Fans will be delighted by this powerful mix of theatrical showstoppers and heart-melting ballads as The TEN Tenors break new ground and take on some of the greatest show tunes in the world. Racing across town on Friday night I was delighted to finally be catching the international success story that is The TEN Tenors. 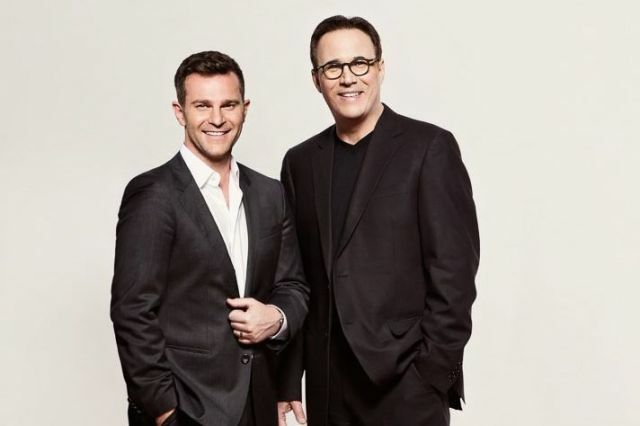 Since forming as students at the Queensland Conservatorium the Tenors have gone on to sell over 3.5 million concert tickets across seven continents, not to mention laying claim to multiple gold and platinum albums. Not bad for a bunch of blokes from Brissy who started the group to raise some extra cash for beer! The currently touring production, On Broadway, is a rousing romp through iconic musical theatre classics from Rodgers and Hammerstein to rock and roll favourites from Queen. Given the hype, I was sure I was about to experience the thrill of the ‘power of ten’ that I have heard so much about. Arriving to find the Lyric theatre packed to the rafters, it was clear the boys have a solid home following; the audience buzzed with anticipation and it was hard not to be caught up in the excitement! After all what’s not to love? Fabulous voices, epic arrangements and rock and roll energy times ten! Over the next few hours the boys delivered a selection of musical theatre favourites old and new…Jersey Boys, Miss Saigon, Phantom of the Opera, Oklahoma, The Wizard of Oz all were on the menu along with the surprising addition of Defying Gravity from the musical Wicked (sure to turn any Elphaba green with envy!) as well as an absolutely gorgeous arrangement of Falling Slowly from the movie/musical Once. A set from West Side Story showed some tight ensemble singing and brilliant onstage camaraderie. While solo moments provided a wonderful opportunity to hear the diverse vocal colours and personality of each singer, combined as ten, they produced a thrilling blend that was beautifully balanced, powerful and rich. It is this collective sound that I’m sure has ensured the group’s ongoing success. A set from Frankie Valli and the Four seasons seemed to be a favorite moment for the boys themselves, the iconic song Sherry in particular was vocally flawless and utterly infectious; my guess is these songs are a lot of fun to sing! The final number, Journey’s Don’t Stop Believing (re-invented on the hit show Glee) was another unexpected addition and had everyone (including my non-dancing date for the night) up on their feet! Along with undeniable vocal prowess, the group’s boundless energy and sense of fun are captivating. Their cheeky banter was relaxed, full of Aussie charm and created a natural connection to the audience. The use of live musicians along with recorded tracks gave life to the arrangements and provided a wonderful sense of authenticity; short solos showcased the skill and musicality of both players. Other production elements, particularly the use of projections I had mixed feelings about. In some sets (Frankie Valli and West Side Story) it added to the experience, in others I found it a little distracting and overly cheesy. The staging and choreography however were seamless and created ongoing visual interest. It also added a great sense of fun; those legs in the kick line were enviable! Essentially The TEN Tenors provided a fabulous, uplifting and fun night of entertainment. Their signature style fuses opera, musical theatre and rock with class and power. It’s clear these boys love what they do, and whether you’re a fan of opera or rock, folk or pop you’re bound to love it too. I know. I’m jumping the gun again. Chaplin – A Life. In Concert doesn’t happen until Friday. But have you worked it out yet?! That’s right! If you don’t book you MISS OUT! The show has received some mixed reviews but you know what I think? I think you need to see David Pomeranz in full performance mode for yourself! One actor, one piano, one amazing performance. This is Chaplin – A Life. In Concert, a unique evening of Musical Theatre which dramatises in song, the life story of the brilliant and controversial artist, Charlie Chaplin, starring multi award winning artist, David Pomeranz. Part Concert; part Stage Musical, Chaplin – A Life. In Concert is an imaginative, emotional and inspiring journey that leaves the audience walking on air, humming its tunes, and in love with the artistry of the great Chaplin. AND MEOW MEOW from 9:15pm (sorry, it’s sold out!). DO YOU KNOW WHAT IT’S LIKE TO DIE ALIVE? Special Offer. No, not to die alive, but to book cheap seats for this phenomenal show! Only until Monday so be quick! Take advantage of this special offer and purchase tickets to Next to Normal for just $30. This offer is only valid for performances on Thursday 18 April 7.30pm and Saturday 20 April 2.00pm and 7.30pm – hurry, offer expires on Monday 8 April. This is not Alice Ripley. This is Alice Barbery. I can’t believe I’ll finally be taking a deep breath, gritting my teeth and sitting through a live production of Next to Normal in just two weeks. In 2009 – 2011 this raw new rock musical by Brian Yorkey and Tom Kitt took over Broadway, the Tonys and YouTube. And my place. I became slightly completely obsessed, with the show, with the story, with the woman grappling bipolar disorder, Diana Goodman, created on stage by the incomparable Alice Ripley. Largely rewritten after its Off-Broadway debut in 1988 (critics had issues originally with the way the book looked at mental illness and treatment options), Next to Normal opened on Broadway in April 2009, winning the 2010 Pulitzer Prize for Drama (previously won by RENT, also directed by Michael Greif), and three (of eleven nominated) Tony Awards, including Best Original Score, Best Orchestration and Best Performance by a Leading Actress in a Musical. This is the Goodman family. They look normal, don’t they? Now, from the creative team behind Oscar Theatre Company’s sellout production of Spring Awakening comes the Queensland premiere of Broadway’s Next to Normal. Next to Normal is an unflinching insight into the humour and turmoil of an ordinary family grappling with the effects of mental illness. With provocative lyrics and a thrilling rock score, Next to Normal is one of the most ground-breaking new musicals and was chosen as ‘one of the year’s ten best shows’ by critics including The Los Angeles Times, The Washington Post, Rolling Stone and The New York Times. Director, Emily Gilhome, describes Next To Normal as her most important show to date. “This is a new kind of musical theatre. It‘s real, raw and explores some incredibly important issues”. A brave and breathtaking show, Next to Normal plays Brisbane for a strictly limited season. Next To Normal plays QPAC from 18th April – 4th May 2013. …but just what is it telling them? For a “timeless musical” (certainly one of the most loved movie musicals of all time), this one sure feels dated. And long. No interval, kids. As the lights came up at the end of the show on opening night in Brisbane, all I could do was sit and think, “Wow. Wow. WOW. THAT’S IT?! WHAT WAS THAT? !” I was in shock! That was the finale? That was the show I grew up singing and dancing to in the living room? That was the song (Nothing) that I sang as my contrasting monologue at auditions for tertiary studies? That was the girl (Cassie) too good for the chorus line? Okay. It’s fair to say that you might have loved this production. In fact, you probs did. It’s probs just me. Is it just me? I know Caroline Hutchinson was there on opening night; perhaps it should be a Mix FM segment after you’ve all seen the show. Because you should see this show. And then let me know what you think. What I think is this: Tim Lawson et al saw the revival production on Broadway and thought we should see it here. But what we are seeing here is not what they saw there. It’s a copy and it’s lost its heart and soul somewhere between New York City and here. Did no one take on the responsibility of breathing new life into Michael Bennett’s original work? Instead of a fresh and vibrant new version, we get a vague, half-arsed homage to a vision that, for a whole new generation is questionable, and to the older ones, those more familiar with it, almost laughable. A Chorus Line is a show about dancers, about heart and soul and blood and guts and sweat and tears. You don’t do it without investing a substantial amount of self. Like any show, you give it your all…and then a little bit more. The last time we saw A Chorus Line was on the Sunshine Coast and the heart and soul that went into that production came across very clearly. Choreographer and Producer, Paul Attow, staged a production in 2004 in Nambour (I know, right? ), something he’d always wanted to do. In fact, putting on A Chorus Line meant so much to him that he mortgaged his house to do so. After 2 successful combined theatre companies’ musicals, the stakes were high, and the production was a hit and most of the performances were as “professional” as we’d seen. As an example, let’s consider Brett Klease’s performance, compared to the monochromatic outbursts from this current Zach (Joshua Horner). Now, let’s get one thing straight. We don’t care what else you’ve done. Sure, a long list of Broadway or West End (alright, or reality TV show) credits could indicate immense talent but I say you’re only as good as the guts you’re willing to give in the show you’re in. Unfortunately, it appears that Horner tried to be as least like Michael Douglas as possible (Douglas made the role famous in the 1985 film), and in complete contrast, comes across as harsh, loud and just plain irritable. 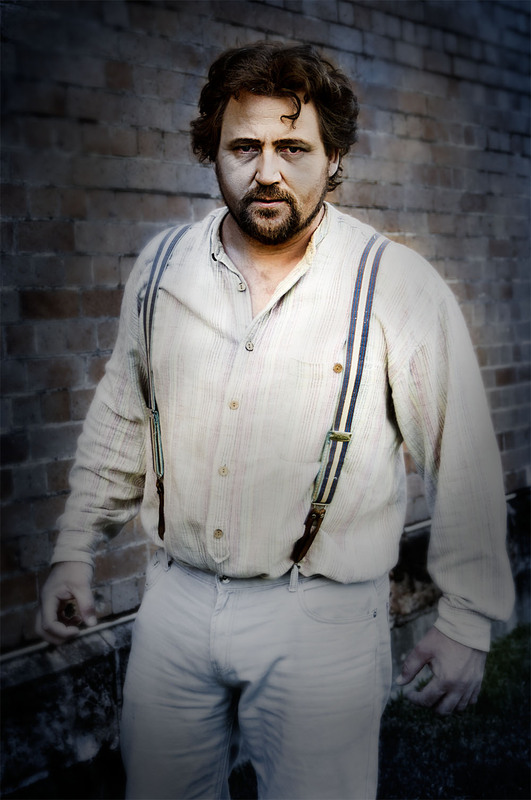 Klease, on the other hand (currently performing in Caravan at Noosa Arts Theatre), in 2004, was able to show the many colours, tones and textures that make up the complex man who cast and directs the Broadway show for which 17 hopefuls line up. In the line-up is his past love, Cassie. Most of these current performers seem…un-stretched. I feel like they want to go there but there’s been no one to say, with a sparkle in their eyes, “GO THERE! DO IT! YOU CAN DO IT!” Perhaps they did go there in 4 previous cities in Australia, perhaps not. This production has received mixed reviews and I know singers, actors, and dancers, dance teachers and non-performers have all loved it. But I want to go on those massive journeys with the characters, not just watch them from afar. I want to feel the same way I do when I watch the movie, or the doco, Every Little Step. I mean have you SEEN that doco? It’s amazing, about how the show came together originally, after Michael Bennett sat down with a group of dancers and a couple of bottles of wine one night, and recorded everything they had to say about the industry, their lives, their loves and their tough skins. It’s real. On the other hand, I haven’t been this unaffected by the stories in a live show since David Atkins’ odd production of West Side Story. Paul (Ross Hannaford) nearly went there, Diana (Karlee Misipeka) nearly went there and then, with the exception of Will Keith as Greg, we watch cardboard cutouts strutting about (Samantha! I mean Sheila! Really?! Others love her. ), that didn’t get anywhere near revealing a full personality, despite the fact that this is the show in which to do so. THIS IS THAT SHOW. We should see more than the iconic poses from each character. We should see more than Cassie and Zach shouting at each other downstage. Geez. What was that? IS IT JUST ME? Luckily, we saw A1 dancing and enjoyed some top voices. (Well, you know if Maggie can’t get “At the Ballet…” you might as well get up and leave but Nadia Komazec underplayed Maggie beautifully, belted that top note and made that number). Look, some of them were maybe thinking, “God, I hope I get it!” on opening night rather than actually getting it. Apparently there were no previews in Brisbane? Perhaps that would have solved the sound issue for the Lyric Theatre (Paul White, we miss the bigger, bolder, brassier sound from Marvin Hamlisch’s score! Is it a System Sound Associates thing? I heard similar comments about the sound for Carmen. In fact, the best sound I’ve heard in the Lyric Theatre in a while was at Rock of Ages.). God, I hope they’ve learned from that. The problem is not what will the audience like (well, clearly that’s a challenge for the investors, promoters and venues), but will this be the pinnacle of Australian musical theatre at this time? What does excellent currently look like, sound like? This? Really? Just this? And there’s the problem. As far as aspiring musical theatre performers (and their teachers) in Australia can ascertain, the current touring production of A Chorus Line is what excellent looks like, sounds like. The quality of a production ultimately lies with the director and while Baayork Lee is my favourite Connie, and while she has remained faithful to the original production’s look and choreography (as noted, the choreography is executed by all with aplomb), I just don’t think that beyond the dance, she’s done all that she can with it. On the other hand, perhaps she has and, ultimately, that’s the problem with this little revival replica. Josh Rowe is playing one of the most gruesome, most remorseless murderers in the history of musical theatre. 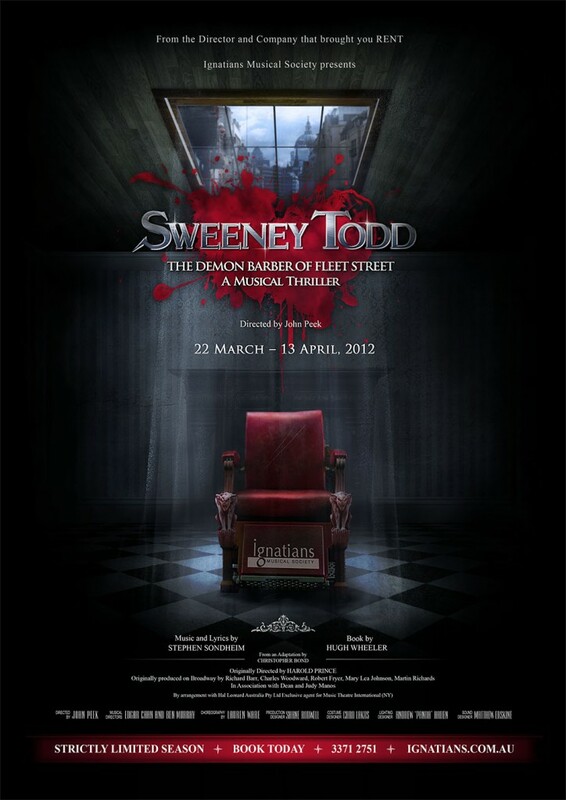 Attend the tale of the man behind Ignatian’s Sweeney Todd, the Demon Barber of Fleet Street. What led you to Sweeney Todd at Ignatians and what attracted you to this challenging role? I studied my Bachelor of music in Classical Performance from 2004 – 2008. I began my professional career with Opera Queensland in 2006. I was also an Opera Queensland developing Artist in 2008, which was a wonderful opportunity to study a number of operatic roles under the guidance of industry greats such as Anna Sweeney (her name is purely coincidence) and Narelle French. I had my solo debut with the company in the Male Ensemble of Richard Mills’ ‘Love of the Nightingale’ in 2007. Sweeney Todd is my 40th production (my 13th professionally) since taking to the stage in 2001. After my Bachelor of music, I had been working away in Western Australia’s North West for a few of years in Mining Construction and decided to return home to spend more time with my growing family. Within a few months of my return I found out on Facebook that Ignatians was auditioning for Sweeney. It seemed like the ideal segue back into singing. As to the role itself… I have always known it to be one of the most challenging roles in music theatre: requiring solid musicianship and an emotional sensibility in order to portray this character as a human being going on an emotional journey rather than just a one dimensional murderous madman. This appealed to me. Can you tell us about the audition process? How did you prepare? I am an Operatic Baritone primarily and this was my first musical theatre audition in over ten years. Musical theatre is quite different from opera in that it is much more physical. Opera auditioning is mostly ‘Stand and Sing’. The Sweeney Todd rehearsal included a dance audition, some acting/stagecraft as well as the singing. Lauren, the movement/dance coach absolutely flogged us in audition. It was hilarious! I went home afterwards and slept for 12 hours. You worked in the mines? Was there any drama attached to that job? Tell us a bit about what you’ve been doing when not on stage. Do you get to see much theatre? What was the last show you saw? I have not been out to the theatre in a long time. There’s not a lot of theatre in the Pilbara. I think the last thing I saw was ‘Spem in Alium’ by Thomas Tallis, conducted by Emily Cox late last year. Where do you chill out in Brisbane? Anywhere my family is. I have three beautiful boys, ranging from 16 all the way down to 20 months and another on the way. When we’re together we like to just watch movies and hang out. If we’re out in Brisbane the boys love to eat at ‘Sushi Train’. It’s always been one of our special things. My wife Emma and I also love to just jump in the car and drive. Anywhere. Get lost and just find our way back. Just for fun. Do you have any special talents that this show doesn’t uncover? You’re not a tap dancer or an aerialist too? Besides being a carpenter, a painter and hopefully a pretty good husband and dad? No! For my next project I will be singing the bass solo for ‘A Sea symphony’ by Vaughan Williams In association with Brisbane Chorale and Brisbane Symphony Orchestra, conducted by Emily Cox. We’re expecting big things from the Ignatians design team, with regard to set and working pieces in order to make this show happen. We won’t be disappointed, will we? What an amazing set this is. The Ignatians team should be proud of what they have achieved. It’s a big, heaving, flowing set with lots of moving parts to excite the eye. I am personally looking forward to my ‘Big Reveal’ at the beginning of act one. That’s all I will say on that. I don’t want to give it away. Can you talk about working with John Peek, who has many new fans after bringing us Ignatian’s fabulous production of RENT? John and I began working together professionally in 2006 on the set of ‘Romeo and Juliette’ for Opera Queensland. Even then I could see he was a force to be reckoned with. His strong stage presence and his understanding of the voice were an inspiration to me. When I found out that John was heading towards more of a leadership role in his musical journey, I decided that one day I had to be directed by him. Sweeney has been such a heavy emotional journey for me… As you know my mother has been very ill with cancer during this production. John has really helped me to push through my overwhelming sadness and find my voice through the tough times. Can you tell us about your Mrs Lovett? What has it been like to work with Miranda on that odd relationship? Miranda is just wonderful. She has a fantastic voice, which is made for the role. Her fiery but down to earth nature, her understanding of comic timing and her background in dance make for a Lovett that leaps off the stage with vibrancy. I am glad that my Lovett is such a consummate professional. It makes my job easy and our bond on stage real but exciting. Is Sweeney Todd just a messed up killer of men or is there more to him? Did you have to find some empathy for him? If so, how did you do that? And why would we side with a murderer? There is always more to the story when good men turn bad and it’s amazing just how quickly deep passion can turn into hate and a desire for revenge. My question to you is what would you do to protect your family? If an evil person wanted to inflict harm on your husband, wife, father or child would you do everything you could to protect them? Would you want that person to pay for what they did? How far would you go to make them pay? These questions cause real emotions to well up in the best of us. As a husband and father, I know that it would take surprisingly little to engage my rage if my family was in trouble. What Sweeney does is not right, but I can understand how he got there. It’s a gory show, lots of blood, Tim Burton’s film actually makes me physically ill; are we going to experience quite that much blood? I need to know so I can psyche up. There is not as much blood in this show. A lot of the staging is still quite confronting and not always easy to deal with emotionally, but not exactly a hack em up horror. A great night out at the theatre!